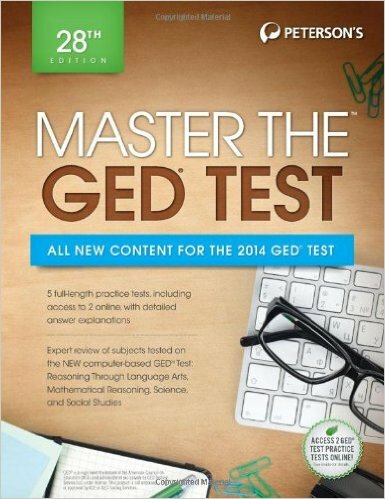 Master the GED is a comprehensive guide that offers the essential test-prep and review material for the high school equivalency diploma test, including practice tests, subject review, and expert tips on how to score high on each GED test. Readers will find the GED information they need to know-scoring and passing requirements, how to prepare, and what to expect on test day. 3 full-length practice tests, including a diagnostic test to determine your strengths and weaknesses, with answer keys and detailed answer explanations for each practice test. PLUS, online access to additional practice tests. In-depth review of each GED test subject with practice questions and easy-to-understand answer explanations, including Language Arts, Writing (Parts I and II); Language Arts, Reading; Social Studies (including Canadian history and government); Science; and Mathematics (Parts I and II). Exercises and drills for every type of question in each GED test subject area, with hundreds of practice questions and detailed answer explanations to reinforce key concepts. Expert strategies to strengthen test-taking skills.